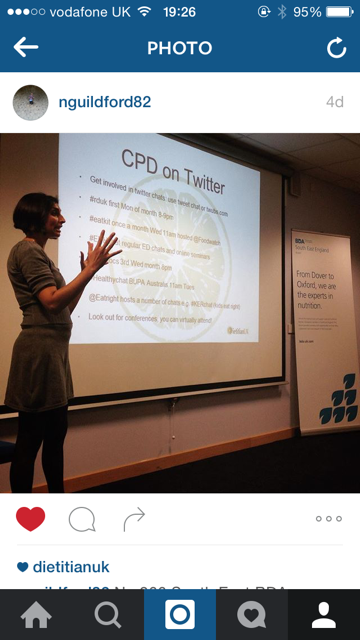 Why dietitians need to be on Social Media. Here is a photo someone took of me and posted on Instagram. Thankyou to Tash Guildford (@NGuildford82 on Instagram). Thanks to Tash Guildford for the photo (@NGuildford82 on Instagram). What it really highlighted to me was the lack of expertise we have in the profession in this area. Which is understandable as it’s not exactly what we were trained in! However in this world of technology when everyone has a smart phone and listens to the info on the internet we need to be have a presence. A good presence. A loud presence. A big presence. If as dietitians and trained nutritionists we think we are the people that the public should be seeking out for their nutritional knowledge then we need to be visible and easy to find. Otherwise there are plenty of others out there giving nutrition advice. Not all good, evidenced based, sensible advice either. 1. Find a platform you like best. Set up an account and watch what others post/do. I like twitter the best. I get business through Twitter, I learn through it, I network with other professionals on it. That’s just my preference however. 2. Follow other nutrition professionals and follow who they follow! Start asking questions and interacting. 3. Post interesting content. Things your patients ask you. Research papers you have read. Websites you like. Good fact sheets. 4. Share other people’s good content. It makes them feel that what they are doing is worthwhile and it stops you reinventing the wheel. 5. Find out your departments social media policy and look at starting a department account that several people can post and run. 6. Don’t get drawn into arguments. It is quite easy to do! Either step back and ignore those types of comments or take it off line. things and they were delighted to help me. 8. Join in Twitter chats and network with others. Don’t sit there silently, just watching. Come and “join the conversation” (twitters tag line). 9. Be yourself. I share some personal info on my social media. It helps people see a bit about who I am and how I work. But don’t over share and be careful what you share. In our house we have some rules about what we post about the children for example. 10. Check out the BDA and HCPC’s social media policy and your local departments too.